Cogne is situated at 1.534 metres, at the heart of the Gran Paradiso Park, of which it is considered the “capital”. Ancient land of Salassi and important iron mining centre, it boasts a rich historical, cultural and traditional past and loves to recount it and relive it through feasts, exhibitions and meetings. Coming up the road from the central valley, you are instantly hit by the incredible width of the Sant’Orso Meadow, green and gently waving in summer, a perfect, pure white in winter. 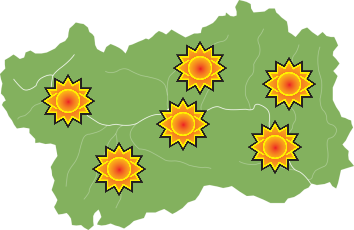 The basin, protected by thick forests, at the convergence of the tributary valleys, is very large with unique sun exposure. Between the vast, bright Sant’Orso Meadow and the nordic forests of conifers and birch trees, Cogne is one of the towns reigning supreme in Valle d’Aosta cross-country skiing. The long cross-country slopes wind under the peaks of the Grivola and the Gran Paradiso for more than 70km, some of which are illuminated. International competitions are held here like the Gran Paradiso March that winds around a 45km ring. These views, however, can be enjoyed without skis, walking along the footpaths that flank the slopes or on horse drawn sleigh excursions, that bring a fairytale feel to the snow. On the slopes of Montzeuc, there is also room for descent with some averagely difficult slopes, while on the Sant’Orso Meadow, a perfect school camp is organised for children. For the more dynamic, Alpine skiing and ice climbing: lovers of this sport come to the more than 130 waterfalls in Lillaz and Valnontey. The Paradisia botanical garden is inside the oldest National Park in Italy and is worth mentioning. The garden is home to more than 1000 species found on our mountains and other mountainous groups from around the world, with two botanical itineraries, a rock exhibition, a collection of lichen and a butterfly garden.